The Esoteric D-05X is a fabulous DAC! The D-02X from Esoteric delivers digital audio as good as it gets! The updated, upgraded Meridian Explorer2! The DACport HD is an awesome portable headphone amp and DAC! Small, lightweight and sounds great! New awesome portable headphone amp and DAC - the Chord Mojo! Cayin delivers the iDAC-6 for desktop headphone listening! Pair with the Cayin iHA-6 for an awesome headphone experience! The Questyle CMA400i is an excellent budget headphone amp and DAC!!! A great combo Headphone Amp, DAC, Preamp, with the Prime power supply. The Lavry DA11 brings digital music to life. We really like DA11! The Questyle CMA Twelve sets another standard for headphone amps and DACs under $1500! The Lavry AD11 is an ideal A to D converter for converting vinyl to digital files. The UD-505 is a fine DAC and Headphone amp from TEAC. The Qutest from Chord sets the new bar for DACs under $2k! The Questyle CAS 192D is a great stand alone DAC and pairs very nicely with the Questyle CMA800R Headphone amp! 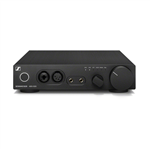 Sennheiser HDV 820 delivers great sound for audiophile headphones! The Bel Canto e.One 2.7 DAC is one excellent DAC and preamplifier! The Questyle CMA800i is an excellent headphone amp/DAC/Preamp combo! The HiFiMan R2R2000 makes a great music source at home, the office or on the go! It does it all! The Hugo updated and improved! The new Hugo 2 sets the standard for portable headphone amps and DACs once again! A great new DAC from Bryston! The Luxman DA250 is a great high end Class A headphone amp with an awesome DAC and A to D converter too! The CMA800R and CAS192D make a fantastic headphone amp and DAC combo and save big time by purchasing them together! The Exogal Comet DAC is a magnificent piece and highly recommended! A great digital music center at a great price! The Chord M Scaler upsamples your digital files for sonic perfection!